Zion Market Research has published a new report titled “Generator Market by Fuel Type (Gasoline, Diesel, LPG, Natural Gas, and Others); by Power Rating (Up to 5 KVA, 5 to 10 KVA, 10 to 15 KVA, and 15 to 20 KVA); by Generator Type (Portable and Stationary); and by End-user (Industrial, Telecom, Residential, and Commercial): Global Industry Perspective, Comprehensive Analysis and Forecast, 2017 - 2024”. 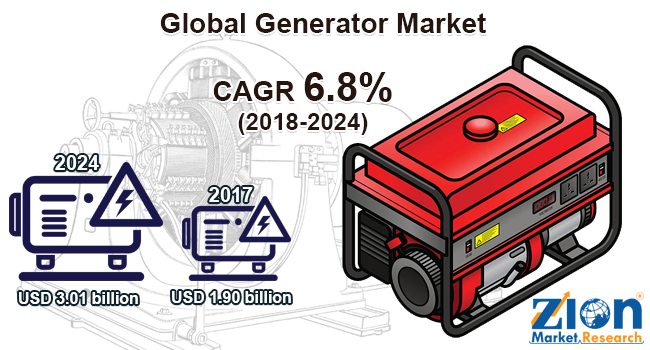 According to the report, global generator market was valued at approximately USD 1.90 billion in 2017 and is expected to generate revenue of around USD 3.01 billion by end of 2024, growing at a CAGR of around 6.8% between 2018 and 2024. A generator is also known as a dynamo, several machines convert kinetic or mechanical energy to electricity for distribution and transmission beyond power lines to commercial, domestic, and industrial customers. Almost all generators are utilized to provide electric power networks that generate alternating current, which reverses split at a set frequency. Almost all power plants use (AC) generators; the exception is photovoltaic cells which employ (DC) generators. The speed and construction of the generator might vary significantly depending on the characteristics of the mechanical prime mover. The electric energy produced can be utilized for power transmission to industrial, commercial, or even domestic level. Generators provide the current which regularly has a frequency of 50 Hz. Major driving factors for the growth of the generator market are increasing demand for IT infrastructure management and rising demand for reliable and uninterrupted power supply. The global generator will offer new growth opportunities for domestic and global manufacturers during the forecast period, due to emerging economies and increasing adoption of bi-fuel, hybrid generators, and inverter generators. Increasing adoption of energy storage technologies may hamper the sales of generators in certain regional markets. High life cycle cost of internal combustion engines is a major challenge for the growth of the generator market. Generator market is classified in terms of fuel type, power rating, generator type, and end-user. In terms of fuel type, the global generator market is segmented into gasoline, diesel, LPG, natural gas, and others. Diesel was the largest fuel type segment of the global generator market. In 2017, diesel generators were mainly preferred power backup and accounted for more than 80% of the global generators market. Low capital cost of diesel generators and advanced technology are the factors driving the growth of diesel generator market during the forecast period. In terms of power rating, the global generator market is divided into up to 5 KVA, 5 to 10 KVA, 10 to 15 KVA, and 15 to 20 KVA. 5 to 10 KVA market segment held the largest market share due to huge demand across the globe during the forecast period. The demand for generators with a power rating between 5 to 10 KVA is estimated to increase during the forecast period due to its use in a wide range of applications such as telecom, oil & gas, healthcare, and data center industries. On basis of the generator type, the global generator market is categorized into portable and stationary. In 2017, the stationary segment was the most attractive generator type. A regular transfer switch is applied to a stationary type of generator which monitors the external power and switches the generator on and off as preferred. Rising demand from residential and commercial sectors and reliable power requirement across industries is the main growth driver of this segment. In terms of end-user, the global generator market is categorized into industrial, telecom, residential, and commercial. In 2017, the industrial end-user segment leads the generator market and is expected to develop at the highest CAGR during the forecast period. The industrial end-user segment growth can be certified to the rapid mechanization in emerging countries such as Taiwan, India, Bangladesh, Nigeria, and Algeria. The Asia Pacific dominated the generator market in 2017 and accounted for contributing a significant share of the market. Countries such as India, China, Japan, and Austria have a high economic growth rate with the increased number of manufacturing industries in the Asia Pacific region. The U.S. accounts for the major share in the North America province mainly due to enormous. In addition, commercial and telecom sectors have an increasing demand for backup power to offset regular power fluctuations thus propelling the generator market in the Asia Pacific. Maximum share of the generator market is expected to be held by North America and Europe during the forecast period. Some of the major players involved in the global generator include Cummins Inc., Kohler Co., Mahindra Powerol, Caterpillar Inc., Yamaha Motor Corporation, Honda Siel Power Products Ltd., KOEL Green, Generac Holdings, Rolls-Royce, Yanmar, and others.